It may be possible to upgrade the graphics cards in the new Mac Pro, according to a Mac4Ever post. The site got a few minutes of hands-on time with the new device and noted that the CPU is completely inaccessible and thus users will not likely be able to replace it. According to our information, it is possible to change the graphics card in this machine. In fact, the GPU is placed on a daughter card, it is possible to remove and thus replace. As you might expect, Apple uses a proprietary connector (as is the case for SSD array present on the rest of the range). But nothing prevents, on paper, a manufacturer decides to offer compatible models on the market. It is even possible that Apple, medium, offers homes in collaboration with AMD solutions. 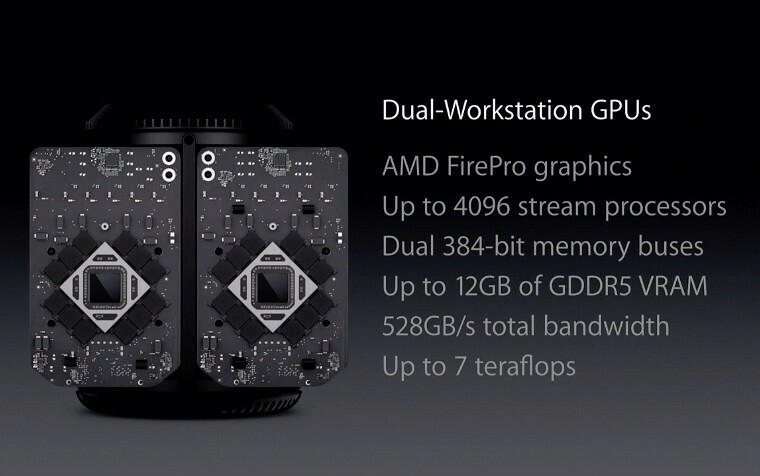 Two workstation-class AMD FirePro GPUs with up to 12GB of video memory provide up to seven teraflops of compute power and up to eight times the graphics performance of the previous generation Mac Pro. It will be available in December starting at $2,999. More details on the device can be found here.You can now download the new Limerain App and follow Limerain on the go. Also follow Limerain on Twitter, Facebook, or RSS to be notified of any updates.